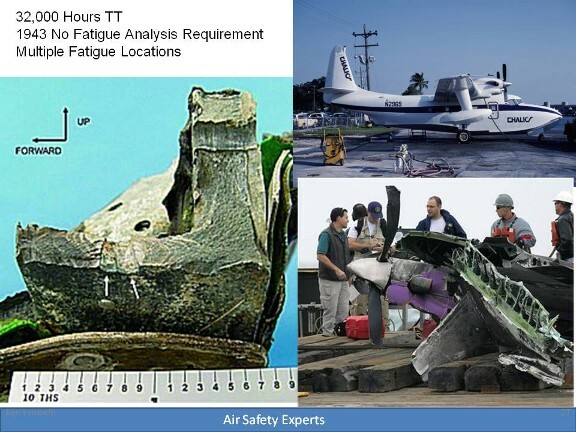 DVI’s Aircraft Accident Reconstruction Experts understand how to determine the reason why airframe component fails, and have investigated failures pertaining to pilots exceeding the airframe design limits and failures originating from material fatigue. Our aviation experts can analyze the aircraft wreckage to identify the telltale signs associated with a particular type of failure mode. The flight operating strength of an airplane is presented on a graph whose vertical scale is based on load factor. The diagram is called a V/g diagram - velocity versus "g" loads or load factor. Each airplane has its own V/g diagram which is valid at a certain weight and altitude. If the subject airplane is flown at a positive load factor greater than the positive limit load factor of 4.4, structural damage will be possible. When the airplane is operated in this region, objectionable permanent deformation of the primary structure may take place and a high rate of fatigue damage is incurred. Operation above the limit load factor must be avoided in normal operation. There are two other points of importance on the V/g diagram. Point A is the intersection of the positive limit load factor and the line of maximum positive lift capability. The airspeed at this point is the minimum airspeed at which the limit load can be developed aerodynamically. Any airspeed greater than point A provides a positive lift capability sufficient to damage the airplane; any airspeed less than point A does NOT provide positive lift capability sufficient to cause damage from excessive flight loads. Point B is the intersection of the negative limit load factor and line of maximum negative lift capability. Any airspeed greater than point B provides a negative lift capability sufficient to damage the airplane; any airspeed less than point B does not provide negative lift capability sufficient to damage the airplane from excessive flight loads. The limit airspeed (or redline speed) is a design reference point for the airplane - the subject airplane is limited to 225 mph. If flight is attempted beyond the limit airspeed structural damage or structural failure may result from a variety of phenomena. Thus, the airplane in flight is limited to a regime of airspeeds and g's which do not exceed the limit (or redline) speed, do not exceed the limit load factor, and cannot exceed the maximum lift capability. The airplane must be operated within this "envelope" to prevent structural damage and ensure that the anticipated service lift of the airplane is obtained. 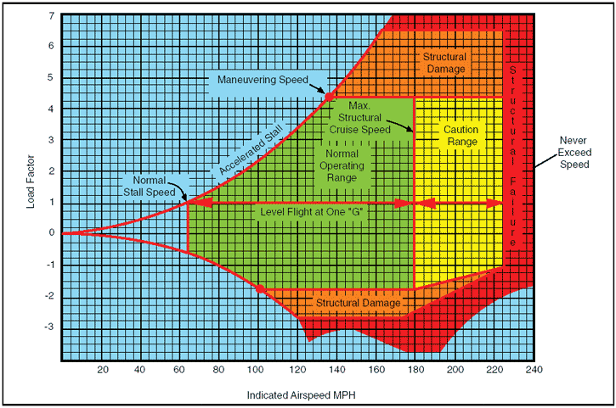 The pilot must appreciate the V/g diagram as describing the allowable combination of airspeeds and load factors for safe operation. Any maneuver, gust, or gust plus maneuver outside the structural envelope can cause structural damage and effectively shorten the service life of the airplane. The GA fleet is being used well beyond the flight hours and years envisioned when the airplanes were designed. In 2000, the average age of the nation’s 150,000 single-engine fleet was more than 30 years. By 2020, the average age could approach 50 years. The bulk of the fleet is designed to Civil Aviation Regulations (CAR) 3 standards that were established in the 1950s or earlier. These standards lack fatigue and continued airworthiness requirements as part of their certification. As a result many of these older aircraft that accumulate significant flight hours need to be inspected more carefully for signs of material fatigue. In materials science, fatigue is the progressive and localized structural damage that occurs when a material is subjected to cyclic loading. The nominal maximum stress values are less than the ultimate. If the loads are above a certain threshold, microscopic cracks will begin to form at the surface. Eventually a crack will reach a critical size, and the structure will suddenly fracture. Cracks propagate because the geometry of a crack produces a very high concentration of stress at the end of the crack and eventually, if a growing crack goes undetected, fracture will occur. The rate of damage propagation is a function of material properties, structural configuration, environment, crack length of primary and secondary cracks, and operating stress exposure. Fatigue cracks have been found to arise in three main ways: 1) in internal load-bearing airframe structural components which can develop stress “hot spots”; 2) in load bearing skins of large aircraft in which the skin itself carries a significant structural load; and 3) from fastener holes such as those for rivets, bolts, nuts and screws where localized stress concentration can initiate premature cracking. Use of multipath construction and the provision of crack stoppers to limit the growth of cracks. Use of duplicate structures so that a fatigue failure occurring in one-half of the member will be confined to that half and the remaining structure will still posess appreciable load carrying ability. Use of a backup structure where one member carries the entire load, with the second member available and capable of assuming the extra load if the primary member fails. Selection of materials and stress levels that provide a controlled slow rate of crack propagation combined with high residual strength after initiation of cracks. Arrangement of design details to permit easy detection of failures in all critical structural elements before the failures can result in appreciable strength loss, and to permit replacement and repair.